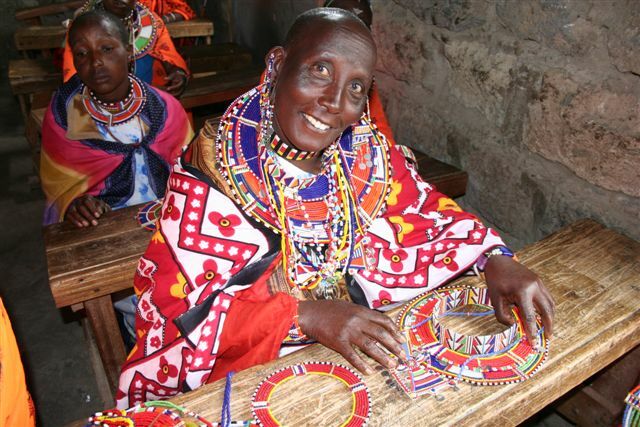 > We headed two hours outside Nairobi south east to visit a Maasai village. This village was a pilot project for literacy training. The older women begged for training so they could read a book they were given for themselves. Usually women of this age were not trained in this way, but the desire and determination of this group was amazing. Carol and Emily from AlARM who conducted the program escorted us and it was worth the drive. We were greeted with hugs and kisses from each and every woman. We then were welcomed with a proper Maasai song and dance. They also started a cooperative beading business and impressed us by telling us the prices of the pieces that they had made and actually counting out the change for us. At one time I was told there was not enough money to make change so of course, I bought one more item to make the money balance. Carol had an order that she had to explain to the women for bracelets, which is the first commercial order this group has had. We promised I would go back and design a couple of pieces and email the ALARM office with an order for bracelets and a belt soon. We tried on baubles and were so sorry to be leaving. We had to drag Susanne to the jeep. She is really ready to stay.